"The Best Source of Hartland Information™"
horse-and-rider sets, and company history. Hartland is the brand name of decorative, plastic products that originated in the 1940s with Hartland Plastics, Inc., of Hartland, Wisconsin. 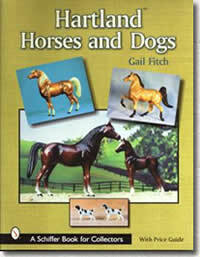 It is most famous for its high-quality model horses, horse-and-rider sets, and ballplayer figurines. After the 1960s, the brand continued under other ownership. 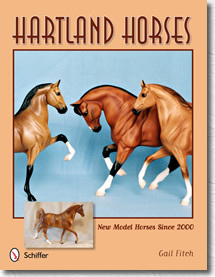 Hartland ranks second only to Breyer in the quantity of rigid-plastic model horses produced since the 1940s. 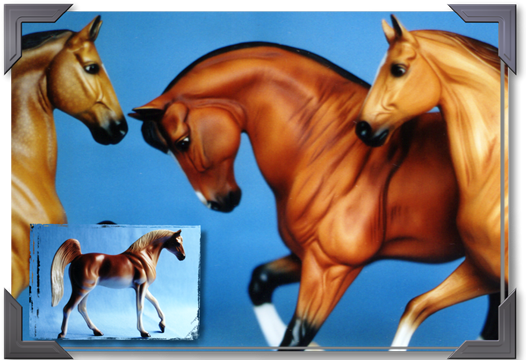 Breyer's first horse was a copy of a 1940s Hartland horse! 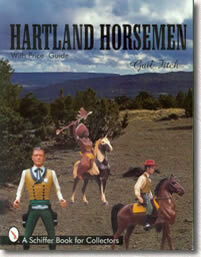 In the 1950s, Hartland produced horse-and-rider sets in the likeness of dozens of TV western and historical heroes. 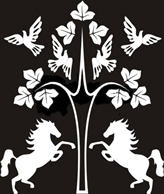 In the 1960s, it issued individual horses and horse families. Later Hartland companies released some of the horse models in additional colors, but few of the rider sets. Hartland is complicated because six different companies have made Hartland horses over a period of seven decades! In quality, some collectors rank Hartland first. Its main horse sculptor actually won awards -- in national contests. Hartland's technical processes were different from others' and allowed a finer level of sculpted detail to be reproduced. Many collectors prefer Hartland's typical light-gloss or semi-gloss finishes over the matte finishes common to most other brands of horses. As one collector (T.H.) said, "They're prettier." And, for horse-and-rider sets, no company comes close. Learn about this important brand of beautifully painted and sculpted horses -- and riders -- in the treasury of three Hartland books by Gail Fitch, from Schiffer Publishing -- with color photos, history, and values! Each book covers different models! Horse-and-rider sets, 1940s -- 1999. Horses and dogs, 1950s -- 2000. Includes the detailed story of the Hartland companies, 1930s -- 2000. Horses and horse-and-rider items produced or sold in 2000-2007. Includes regular-run, special run, and gift-run (contest) models, Roy Rogers and Dale Evans sets, and many unique, test models! "A fabulous book"	"Visually arresting"
Buy from the author -- The three Hartland books published by Schiffer are available from booksellers everywhere, but you can still buy them from the author. Gail (1) will sign and number each book, (2) can write, "To ----" [fill in the name], and (3) will enclose a quick index- outline-update sheet. Prices -- Each book is $30 by PayPal or $28.50 by personal check or money order. Two books shipped together are $58 by PayPal or $55 by check or money order. The latest issue of Gail's magazine for horse lovers and collectors is Summer 2018. You can order back issues, too. Send an email to gfitch@tds.net to always be notified of the next issue. 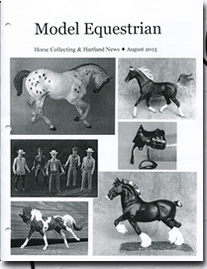 Model Equestrian: Horse Collecting & Hartland News, Summer 2018 (above, right) is 20 pages of news, reviews, tips, history, and humor for model horse hobbyists, Hartland collectors, TV western fans, and horse lovers. A few of the topics are Queen Elizabeth, Mr. Ed, Jon Stewart, Hartland's "General Grant," and Copperfox Jasper. To use PayPal, go to Catalog page. 1733 N. Cambridge Ave., #109 That is also the email address if using PayPal. PEOPLE LOVE THE NEW BOOK! “Fabulous. Love it!” – D.H.
“It’s lovely, just like your others.” – K.W. “Can hardly wait for your next book to come out.” – J.Y. “Very nice, so delightful. Thank you for all your hard work.” – M.C. “It is gorgeous. Such a nice dedication to your parents, too.” – L.C. “There are a whole lot of models here I knew nothing about, but thanks to your dedication, I now do!” – C.C. “I love your books. The colors are beautiful, and it is well thought out and, of course, well researched!” – A.P. “I really, really like it. You did an awesome job! Thank you again for all of your hard work to put this book out for all of us Hartland collectors.” –A.K. “It’s a beautiful book! You have so much detail in your descriptions of each photo. They’re fun to read. Hartland is such an interesting company. I’m glad to have this book.” – B.W. “I’m going to order a second book…I’ll be reading this one to death! Already, I see a lot of colors of the -- -- that I want to add to my collection. I currently have 22 different colors…Boy, do I have a long way to go.” – C.O. “The book was well done. I love how the horses were superimposed on the pages, the photos were lovely, and I really enjoyed reading your “autobiography” at the end… Thanks again for another great Hartland book, and keeping the Hartland history alive.” – S.T. “Now, I know I own a -- -- , and that there are other Hartlands I’d like to get my hands on as well. They are uniquely appealing, and the photos in the book really show them off. The level of detail in the text is phenomenal. It’s easy to tell that your writing the Hartland books has been a labor of love.” – R.B. “I’m going to be taking my time and savor every minute reading through this book. Thank you for all you’ve given of yourself, not only for the love of Hartland, but the model horse hobby as a whole.” – I.C. Do you have an unusual model you want my opinion on? Also, I can give referrals on many matters related to Hartland. Because of my contacts, reputation, and extensive knowledge of Hartland models, I've done some commission sales of Hartland models. Email me. Check eBay auctions by hartland_guru for Hartland books and, occasionally, my doubles on Hartland horses or things I'm selling on commission. Due to a death in my friend's family, that can include Hummels. Join my private email list! 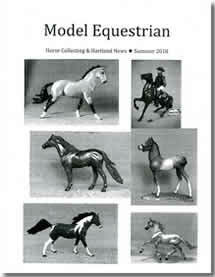 MODEL EQUESTRIAN: Horse Collecting & Hartland News, Issue 17, was published August 15, 2013. It is 28 pages, two in color. See Catalog and Order Form pages. In 1980, Gail Fitch began locating and interviewing Hartland officials. The result was Hartland books -- in color -- many editions from 1983-1998. She also wrote articles for newspapers, collecting magazines, and model horse journals, and produced a popular Hartland newsletter in 1994-1996. Her 1998 and earlier publications are retired because they have been replaced by the much better books from Schiffer Publishing! 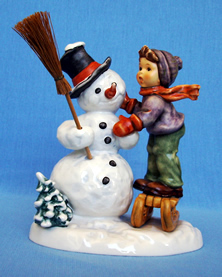 The Hummel figurine, "Making New Friends," includes a boy with a snowman that is holding a broom made apparently of straw or some other natural material. The broom is not porcelain. It is removable. This figurine was at auction on eBay. In my photo there, I forgot to include the broom. I added this photo here on June 29, 2013, because eBay's software would not let us add a photo after bidding had started. Home Page updated: July 21, 2012, April 13, 2013, January 17, 2014, December 16, 2014; February 14, 2016, April 25 and 26, 2016 ... April 15, 2017, and in April 2018. July 8, 2018.